This page will walk through Java 9 Reactive Streams tutorial. Reactive stream is a specification that provides a standard for asynchronous stream processing with non-blocking backpressure. Reactive stream implementations are validated against Technology Compatibility Kit (TCK). Java 9 provides Flow class that has interrelated interfaces related to reactive stream. These interfaces are Flow.Publisher, Flow.Processor, Flow.Subscriber and Flow.Subscription. Java 9 provides SubmissionPublisher class that is a compliant reactive-streams publisher. a. Responsive: System responses in-time. b. Resilient: System responses even if there is failure. c. Elastic: System stays responsive even if there is workload. d. Message Driven: Reactive systems rely on asynchronous message passing. Backpressure is the growing backlog of unconsumed items. Backpressure is created when producer is producing items on faster rate than the subscriber is receiving. Reactive stream specification provides non-blocking backpressure. Reactive streams library implementations are validated by Technology Compatibility Kit (TCK). TCK guides and helps to implement reactive stream implementation against the reactive stream specification. Java 9 SubmissionPublisher is a compliant reactive-streams publisher. In dynamic push/pull backpressure model, sometimes it uses pull-based model and sometimes it uses push-based model. If a system has a fast publisher and slow subscriber then dynamic push/pull Model uses pull-based approach in which subscriber always requests, how many items it can receive, to publisher and then only that number of item is produced by publisher for that subscriber. In push-based model, publisher will be slow and subscriber will be fast. In this case publisher can continue producing items as fast as it can and subscriber will receive items just-in-time. 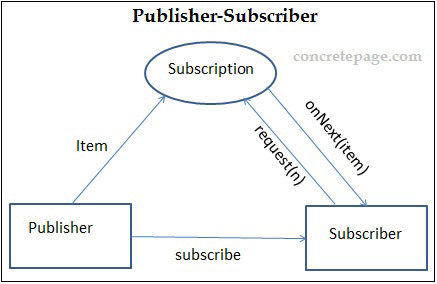 Java Flow.Subscriber requests given number of items from Flow.Publisher using request method of Flow.Subscription. Flow is class that contains interrelated interfaces and static methods that manages publisher, subscriber and subscription. These interfaces are Flow.Publisher, Flow.Processor, Flow.Subscriber and Flow.Subscription and are related to reactive streams specifications. Publisher has subscribe method, Subscription has cancel and request method and Subscriber has onSubscribe, onNext, onError and onComplete method. Processor implements all methods of Flow.Publisher and Flow.Subscriber. All these seven methods return void. This is because to keep communication in one-way message style. Communication is performed in such flow control that avoids resource management problems. The interfaces inside Flow class are as following. Flow.Subscriber<T>: It receives messages produced by producer. Flow.Publisher<T>: It produces items to be received by subscribers. Flow.Processor<T,R>: It acts as both a producer and a subscriber. Flow.Subscription: It is a message control between producer and subscriber. Let us understand these interfaces in detail. Flow.Subscriber is the receiver of messages. It has following methods. onSubscribe method is invoked to enable subscriber to receive messages. Out of all methods of Flow.Subscriber, this method is invoked first. If there is error at this step, then resulting behavior is not certain, possible that subscription will not be established or to be cancelled. Inside this method we usually call request method of Flow.Subscription. onNext method is invoked for next item of Flow.Subscription. If this method throws an error, possibly subscription will be canceled. onError method is invoked when Flow.Publisher or Flow.Subscriber throws unrecoverable error. After getting error, no more method of Flow.Subscriber will be executed by Flow.Subscription. If onError method throws exception, then resulting behavior is undefined. onComplete method is invoked when no invocation of Flow.Subscriber method is left for a Flow.Subscription that is not already terminated by an error. For any Flow.Subscription error, no more Flow.Subscriber method will run and this will not be the case of onComplete method invocation. If onComplete method throws error, the resulting behavior is undefined. Flow.Publisher produces items to be received by subscribers. Each subscriber receives the same item in same order using onNext method of Flow.Subscriber unless no error occurred or subscription is cancelled. When Flow.Publisher throws error, it will be received by onError of Flow.Subscriber and no other message will be received by Flow.Subscriber. When Flow.Publisher completes producing message normally, the onComplete method of Flow.Subscriber will be invoked and then no other message will be received by subscriber. Flow.Subscriber has following method. subscribe method adds the given subscriber to the calling publisher. On successful subscription, the onSubscribe method of Flow.Subscriber is invoked. If there is an error to execute subscribe method, the onError method of Flow.Subscriber will be invoked. Flow.Processor acts as both a subscriber and publisher. It inherits methods of Flow.Subscriber and Flow.Publisher interfaces. So Flow.Processor contains subscribe, onComplete, onError, onNext, onSubscribe methods. Flow.Processor is used for object transformation. Suppose producer produces object A and subscriber will receive object B then processor will transform object A to object B. Subscriber will subscribe to processor and processor will subscribe to producer. The items produced by publisher, will be received by processor and then processor will produce that items to be received by subscriber. Flow.Subscription is a message control between Flow.Publisher and Flow.Subscriber. A subscriber receives a message only when requested and may cancel subscription at any time. The methods of Flow.Subscription are invoked only by their subscribers. Find the methods of Flow.Subscription. cancel method cancels the subscription of subscriber and stops receiving messages. A canceled subscription will not invoke onComplete or onError method of Flow.Subscriber. SubmissionPublisher is the implementation of Flow.Publisher interface. It provides submitted items to subscriber. Once it is closed then no item will be delivered. All subscribers receive items in the same order as produced by producer. SubmissionPublisher is a compliant reactive-streams publisher. By default SubmissionPublisher uses ForkJoinPool.commonPool() for async delivery to subscriber. We can use Executor by passing as constructor argument while creating object of SubmissionPublisher. We will use SubmissionPublisher as publisher in our example. Find the diagram of communication between publisher and subscriber. Now we will create a news publisher and subscriber example. System.out.println("Error encountered by Publisher or Subscription: "
In this example publisher will be subscribed by more than one news subscriber. Processor is used for transformation of object. When subscriber will receive different object than the publisher produces then we need processor. 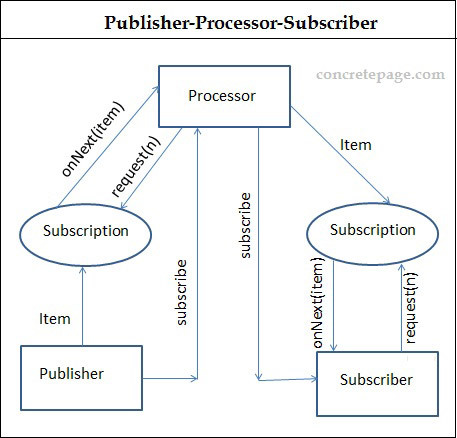 Find the diagram of communication between publisher and processor and between processor and subscriber. Now find the example of article publisher, processor and subscriber. In our example, publisher will produce Article and subscriber will receive JavaArticle. Processor will transform Article object into JavaArticle object. Find the example to cancel the subscription.